Thou Shalt Blame A Loss on Any and All Goals Conceded Following a Red Card on Player Who Drew Said Red Card, Regardless of What Events Preceded or Followed It. But I am here today to break (‘Brek’?) that rule, because it’s a dumb, lazy soccer trope that makes no sense. Yes: I come to praise brand new Vancouver Whitecap Brek Shea, not to bury him. No, I will not praise him for swearing at referee Ismail Elfath in the 70th minute when the score was still 0-0, for which he received an immediate second yellow card after getting the first for a routine foul on Nick Hagglund. But the gun-loving American double pony-tailed tall man deserves some credit for giving Vancouver their best, faint hope of beating Toronto FC during a good spell in the second half, in a game where Carl Robinson’s Whitecaps were shockingly bad moving forward. Not that Toronto FC put on an attacking masterclass either, though they were the better side at BC Place. For much of the game, Toronto—without Seba Giovinco due to last week’s leg contusion business—attempted to swing long pass after long pass toward Justin Morrow out on the left flank, maybe in the hope he’d conjure up some of last week’s magic against the Philadelphia Union (my utterly uneducated tactical impression is that Morrow is very good swinging in early crosses). My high hopes for Tosaint Ricketts were also dashed, as the Canadian forward, in for the Atomic Ant, did little to impress. But Toronto was at least a team that was able to hold possession for a reasonable amount of time in the opposition final third, which rumour has it may be related to scoring goals. They owned BC Place. 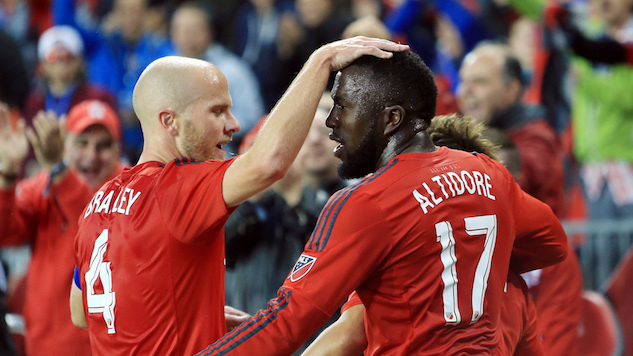 Speaking of goals and that red card that supposedly ‘change the game’, perhaps you are a tactical wunderkind and can tell me in specific, clear terms why Shea’s absence allowed Victor Vasquez to waltz in as the Vancouver backline were caught watching as Raheem Edwards’ cross bounced off Jozy Altidore’ forehead for an easy set up in the 76th minute for one-nil TFC. Or how Shea’s red card allowed Altidore to turn and shoot unimpeded with a Vancouver player about a yard and a half away from him in the 18 yard box, for 0-2. Neither situation read to me like something that would have been avoided with a 10th outfield player, but what do I know? Hot tip for you nerds out there: check your little spreadsheets and SQL tables, isolating for this and that and weighting for this that and the next thing, whether red cards are truly the bringer of rain. Because as far as I could tell, I did not sense any catastrophic mental collapse on the part of the Whitecaps once Brek walked off. The result was a deserved road win for the Reds, who will start their first home match in two weeks’ time with 5 points from 9. No need for Vancouver to panic yet either. That’s the good news! Now for the…well, not exactly bad news. But the doubt. Football is a sport of naked emperors, one where firm opinions about the value of certain players from a few influential people are glommed on by everyone and accepted as gospel truth. “Aw, he’s a fox in the box. That guy, he’s a commanding central defender, the team fulcrum” etc. Most of the time, uncertain about my own ability to see these things, I generally accept these opinions on face value. I go along with them. But the buck stops at one player: we need to talk about Michael Bradley. I like Bradley, I truly do. He has a good head on his shoulders, he comes from a great family of football-minded American old boys, he’s a smart footballer. I also accept there are more than a few schools of thought on the role of the holding midfielder, the Makelele role. For some, it means cycling possession no matter to whom and under what context, safety first. For others, like me, it means being the spark in the engine room of a team attack. So I couldn’t help but feel frustrated as, again and again, the number 4 opted for the back or sideways ball under the slightest hint of opposition pressure, despite more than a few opportunities to play it forward for a reasonably high return, low risk pass. I know he’s out there on the pitch and I’m here in my hole in Toronto, watching along with the camera operator. But some guile from Bradley, at least once in awhile, even with the score 0-0, would be nice. Finally, a word on the 24 year old Vancouver reserve keeper, Spencer Richey, who was on for a suspended David Ousted. He was magnificent, even put in a highlight reel save on a searching shot from Justin Morrow (and was not at fault for either goal). Don’t let him rot away in the USL (no offense, USL). Let his performance be remembered.